This is a medieval English locational surname. Recorded as Hartwell and Hertwell, it originates from or all, of the four villages and parishes called Hartwell in the counties of Berkshire, Northampton, Hertford, and Sussex. All seem to have been recorded in the famous Domesday Book of 1086, and all would seem to have the same or similar meaning of the stags drinking place. This may suggest that all the Hartwell villages were in areas kept as royal hunting grounds. The taking of deer by other than the nobility being unlawful, the village name might have been a sort of warning to people not to trespass, but that is not proven. Locational surnames are usually "from" names. That is to say names given to people after they left their original homesteads to move somewhere else. 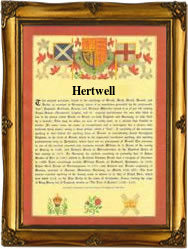 However in this case, or certainly as applies to the Hartwells of Northampton, the name was given because they were the lords of the manor of Hartwell. Decennarius de Hartwell being so recorded in the Hundred Rolls of Landowners on the year 1273. Later examples include Agatha de Hertwell of Buckinghamshire in 1279, and in the city of London Jonah Hartwell, who was christened at the church of St Benet Fink, on April 21st 1549. This was during the reign of King Edward V1th (1547 - 1554), known to history as "The boy king."